Common Barberry (Berberis spp. ): growing, planting, caring. Berberis vulgaris, also known as common barberry or European barberry is a shrub in the genus Berberis. It produces edible but sharply acidic berries, which people in many countries eat as a tart and refreshing fruit. The perfect shrub... but keep away from its spines ! Scientific name : Berberis spp. Barberry is a deciduous shrub native to central and southern Europe, northwest Africa and western Asia it is also naturalized in northern Europe, including the British Isles and Scandinavia, and North America. In the United States and Canada, it has become established in the wild over an area from Nova Scotia to Nebraska, with additional populations in Colorado, Idaho, Washington State, Montana, and British Columbia. It is cultivated for its fruits in many countries. It grows up to 4 metres (13 ft) high. The leaves are small oval, 2–5 centimetres (0.79–1.97 in) long with a serrated margin. They are borne in clusters of 2-5 together, subtended by a three-branched spine 3–8 mm long. The flowers are yellow, 4–6 millimetres (0.16–0.24 in) across, produced on 3–6 centimetres (1.2–2.4 in) long panicles in late spring. The fruit is an oblong red berry 7–10 millimetres (0.28–0.39 in) long and 3–5 millimetres (0.12–0.20 in) broad, ripening in late summer or autum, edible but very sour, and rich in Vitamin C.
Plant from late autumn to early spring, in the sun, in rich, well-drained soil. Take gloves for handling. For hedges, plant every 0.5 to 1 m. The planting distance depends on the height and thickness of the desired hedge. Plant tight for a low hedge, and spread out for a tall, thick hedge. Dig a hole about twice the size of the root ball, without mixing the layers of soil. Do not bury the base of your berberis, put back the soil and tamp it well around the roots. Form a hollow and water until the water no longer flows visibly. Berberis are sober like camels, so after the first few weeks, you should not have to water them anymore. In pots, water only when the soil has dried. In late spring and summer, some berberis can be literally stripped of their foliage by hungry caterpillars. Do not panic: put a sheet on the floor, shake the foliage - a broom does the trick - and get all those little opportunists. These are not great a walking, so releasing them a dozen meters further into the garden should be enough. Repeat it a few days later to catch the last ones. Go crawling under a thorn bush to weed is not really a sinecure ... So avoid problems and regularly put mulch at its foot. Berberis likes humus soils composed of leaves, small sized debris, or crushed wood. NB: Avoid depositing fresh wood waste in the spring, they cause a "nitrogen hunger" point. 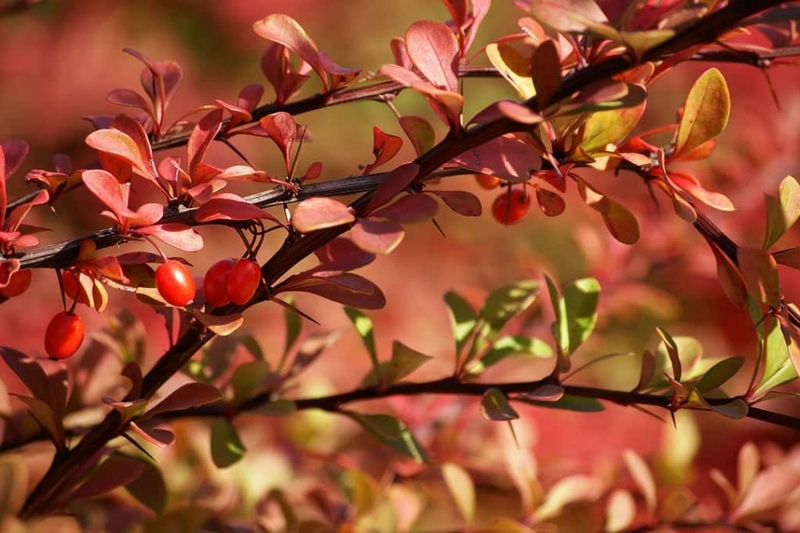 There are two periods for pruning berberis, depending on whether their foliage is evergreen or not. In autumn, prune your evergreen berberis in hedges. You can keep them in a rounded shape, the "military" cut does not suit them well. For deciduous solitary berberis, prune only after flowering every 2-3 years. Remove some of the old inside branches, and slightly shorten the whole plant. For berberis that are evergreen - whether in hedges or isolated - trim lightly after flowering, especially the ends of the stems.